1996 Post-release survival of oiled, cleaned seabirds in North America. Ibis 138:222-228 (Download PDF). 1996 Total direct mortality of seabirds from the “Exxon Valdez” oil spill. Ford RG, Bonnell ML, Varoujean DH, Page GW, Carter HR, Sharp BE, Heinemann D, Casey JL. Pp 684-711 (in) Rice SD, Spies RB, Wolfe DA, Wright BA, editors. Proceedings of the Exxon Valdez Oil Spill Symposium. American Fisheries Society, Bethesda, Maryland 931 pp. 1996 Effects of the “Exxon Valdez” oil spill on the Black Oystercatcher. Sharp BE, Cody M, Turner R. Pp 748-758 in: Rice SD, Spies RB, Wolfe DA, Wright BA, editors. Proceedings of the Exxon Valdez Oil Spill Symposium. American Fisheries Society, Bethesda, Maryland 931 pp. San Francisco Chronicle, Opinion, June 23, 2010. “Cleaning oiled birds saves very few” Brian Sharp. National Public Radio. Morning Edition June 14, 2010. “Should Oiled Birds Be Cleaned” Nell Greenfeldboyce. Transcript and recording available on the NPR website. Discovery Channel, 1999, Oil Still Present Ten Years After “Exxon Valdez”, Bill Blakemore ABC News. London Sunday Times, March 3, 1996. �������Most rescued seabirds die within days.” Steve Connor, Science Correspondent. New Scientist, March 9, 1996. “Cleaned birds unlikely to survive, in the wild.” Fred Pearce. British Broadcasting Corporation (BBC) TV, March 12, 1996. Countryfile, “Sea Empress Oil Spill, Wales and oiled bird rescue.” Paul Newman. National Public Radio. All Things Considered, June 13, 1996. “Oiled Seabird Rehabilitation.” David Baron. 1965 Samuel Beckett, Antithesis: Ontology, Epistemology, and Eschatology. Bachelor of Arts Thesis, Wesleyan University, Middletown, Connecticut. 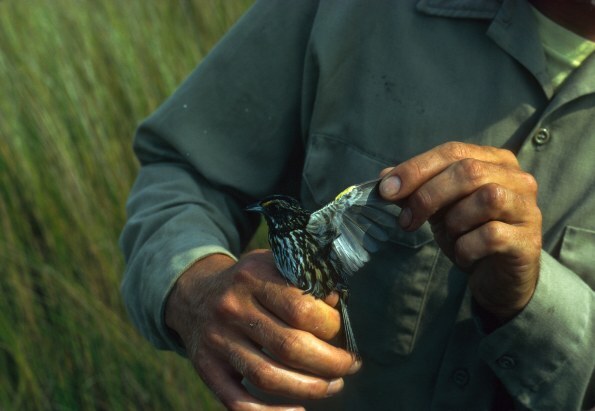 1969 Conservation of the Dusky Seaside Sparrow. Biological Conservation 1:175-176. 1969 Let’s save the Dusky Seaside Sparrow. Florida Naturalist 42:68-70. 1970 A population estimate of the Dusky Seaside Sparrow. Wilson Bulletin 82:158-166. 1971 Heavy mortality of migrating birds at Madison’s TV towers, Wisconsin. Passenger Pigeon 33:203-204. 1972 Eastward migration of Blue-winged Teal. Journal of Wildlife Management. 36:1273-1277. 1971 A transcontinental Mourning Dove recovery. Auk 88:924. 1977 Bald Eagle management guidelines Oregon-Washington. U.S. Fish and Wildlife Service, Portland, Oregon 7pp. 1984 An exaltation of eagles. Oregon Wildlife 39:10-11. 1985 Management guidelines for the White-faced Ibis, Great Basin population. U.S. Fish and Wildlife Service, Portland, Oregon 31 pp. 1985 Avifaunal changes in Central Oregon since 1899. Western Birds 16:63-70. 1986 Guidelines for the management of the Purple Martin, Pacific coast population. Sialia 8:9-13, 30. 1986 Management guidelines for the Swainson’s Hawk. U.S. Fish and Wildlife Service, Portland, Oregon 28pp. 1987 Management guidelines for the Willow Flycatcher. U.S. Fish and Wildlife Service, Portland, Oregon 21pp. 1990 Population trends of Oregon’s neotropical migrants. Oregon Birds 16:27-42. 1992 Neotropical migrants on national forests in the Pacific Northwest. Contract with U.S. Forest Service, Portland, Oregon 800 pp. 1992 Dusky Seaside Sparrow: In Memoriam. (Inclusion) Mark J. Walters, A Shadow and a Song Chelsea Green Publishing, White River Junction, Vermont. 1993 Measuring productivity of murres by the Mayfield method. Poster paper presentation. Pacific Seabird Group Meeting, Feb 9-13 1993, Seattle Washington 2 pp. 1994 Avian biodiversity and abundance in Northeast Portland, Multnomah County, Oregon. Oregon Birds 20:85-86. 1995 Brown-headed Cowbirds and grazing on national forests in the Pacific Northwest. Northwest Naturalist 76:121-126. 1996 Post-release survival of oiled, cleaned seabirds in North America. Ibis 138:222-228 (Download PDF not yet available). 1996 Avian population trends in the Pacific Northwest. Bird Populations 3:26-45. 2003 (Mortality statistics on oiled birds, declining species in national forests.) Harper’s Index. Harper’s Magazine May 2003, p 11. 2004 Changes in breeding bird species in a Pennsylvania State Park, 1959-2003. Sharp BE, Murphy B, Pennsylvania Birds 18:70-71.